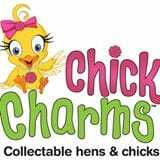 It is time to start your flock with Chick Charms Hen and Chicks. Chick Charms® are a drought tolerant perennial that are hardy in zones 3-9 and grows well in full sun to light shade. Hen & Chicks consists of one large rosette (the "hen") and many smaller rosettes (the "chicks") which can be pulled up and replanted elsewhere to start new plants. If 'gardening' really isn't your thing, Chick Charms® can be! Collect several of our 'chicks' and create a table top planter, perfect for patios, desks or any bright location in your home. Succulents are perfect for the gardening expert as well as for the beginner gardener. Start collecting Hens and Chicks, Chick Charms®, now for years of enjoyment!